HUB/LAB provides an opportunity to work on vertical dance projects, divided into a distinct series of practical sessions run by a team of choreographers who are all members of the Vertical Dance Forum: Wanda Moretti - Il Posto (Italy), Fabrice Guillot - Retouramont (France), Chantal McCormick - Fidget Feet Aerial Dance Theatre (Ireland), Lindsey Butcher - Gravity & Levity (UK), Kate Lawrence - Vertical Dance Kate Lawrence (North Wales), Marija Scekic - Histeria Nova (Croatia), Julia Taffe - Aeriosa (Canada). For the first time ever, Il Posto is introducing a new kind of HUB/LAB Vertical Dance in Venice. Tailored to the needs of international choreographers, it will offer insight and the tools needed for artists/companies wishing to increase their knowledge and expertise for their vertical dance projects. The project is aimed at companies or individual dancers and choreographers, and concerns both projects in their initial phase and those which are already underway. 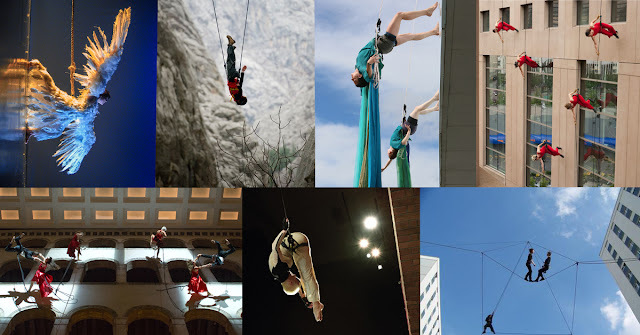 This open call is aimed at artists, local or international groups who work in the field of vertical dance, the artists can participate via a public call and by sending an outline of their project via email to Il Posto. You will receive 3 days of individual coaching from some of the most experienced vertical dance choreographers in Europe and Canada. In the HUB/LAB you will focus on your own vertical dance project guided by your mentor(s). There will be 8 hours per day of practice, discussion and sharing, facilitating access to knowledge, techniques, interdisciplinary skills, community, training and performance, use of materials and security protocols. In addition, you will be offered remote coaching from your VDF Vertical Dance Forum mentor until the end of your production. All the projects will video recorded and documented in the web platform of the project. The closing conference is scheduled for November 3rd at 6,30pm, the talk is open to the public and will present the HUB/LAB process and the EUROPEAN VERTICAL DANCE CENTRES.